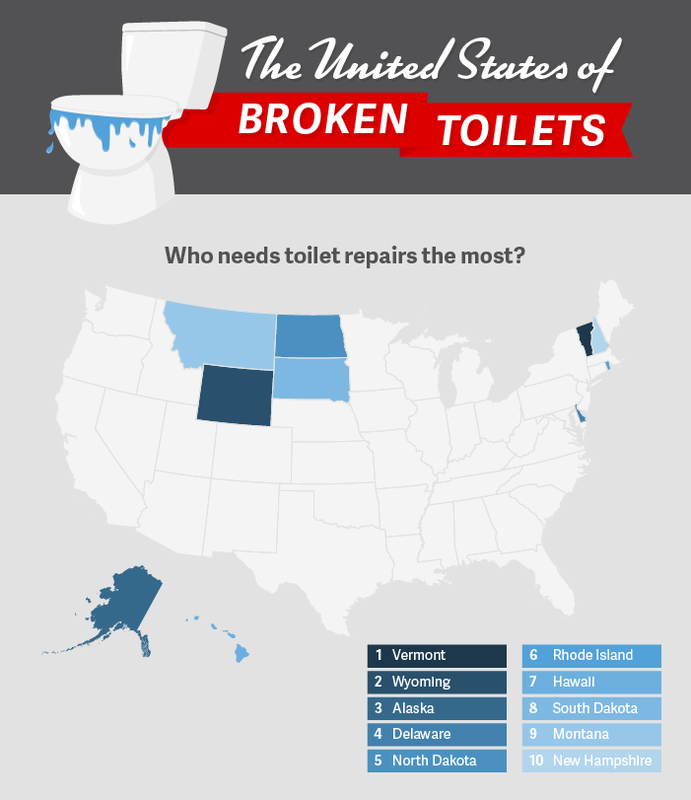 Which State Clogs Their Toilet the Most? HomeBlogWhich State Clogs Their Toilet the Most? It’s a problem we’ve all faced at one point or another, whether or not it was our fault. It could be a faulty pipe, or it could be the fact that someone stuffed half a roll of paper towels into it. We are talking, of course, about toilets. And because all of us have experienced this stinky situation, we thought we’d find out which states seemed to be facing this problem more than others. While there seems to be a lot of people in need of information on how to fix a toilet in Vermont, the state itself has a good handle on composting that waste. Their wastewater solutions prevent human waste from entering the water stream so that drinking water remains fresh. They have instituted water conservation efforts as well, such as dual-flush toilets, in an effort to help the environment. While Wyoming may have searched how to fix a toilet 52,000 times in the past year, their state university would like you to know how to prevent such failings from happening in the first place. This is easy for us adults to read, but can be harder to convey to little ones suddenly enamored with with water going in a circle. At least Wyoming’s citizens are taking steps to solve common potty-training miscues. With further research, it seemed strange that Alaska would appear on this list, as approximately 6,000 homes operate without a flushable toilet. This is by far the most of any state in the U.S., but it may just be for the best. Citizens of the Last Frontier searched for how to fix a toilet a total of 64,000 times. It seems Delaware’s main problem is with running toilets, as that a “how to fix a running toilet” was searched more often than other similar terms referenced. If it’s running, most of the time the problem is going to be with the float arm mechanism in the back part. If simply jiggling the handle doesn’t work, you may have to replace it, which isn’t as complicated as it sounds. It seems that one of the reasons so many Northern states are in the top 10 is because of the cold weather. Freezing temperatures can affect the drainage of water and disrupt the flow of pipes in your sewer vents. A good indication of this happening is if the toilet is gurgling or not flushing properly. A good way to prevent this problem is to have a heating professional install a heat register near the pipes to keep the space warm. The smallest state in terms of land mass is not the smallest when it comes to population, so the sewage systems have to be on point at all times. It was actually one of the first states to implement a sewer system and, after undergoing an $88 million overhaul in the 80s, today has one of the best treatment plants in the country. Water conservation is a big deal in Hawaii, which has led to many households and businesses installing low-flow toilets. This can cause some problems though, especially with clogging, as the septic system and pipes may not be able to handle the reduced flushing power. It’s important to ensure your system has the capability to still function properly when considering installing one of these toilets, no matter the state in which you reside. Overall, the flushing of toilets combines for a good amount of the water usage in South Dakota. This is again where dual flush toilets can come in handy, so that excess water isn’t wasted while larger amounts of water can be used for the bigger things that need to be flushed so clogs can still be prevented. Approximately 12% of Montana’s population lives in mobile homes or RVs, which ranks 11th in the country. Despite that freedom to travel with all of your stuff, they can still encounter the same problems as homes with a foundation, namely clogged toilets. This problem can be more complicated on an RV than in a house, and you may need a few special tools for the job, as a plunger may not be so reliable. Based on a per capita percentage, New Hampshire owns the sixth most recreational boats of any state in the country. So there stands to reason that some of its citizens may be wondering how to fix a toilet on a boat. Much like the aforementioned RVs, this takes a bit more than a plunger. Toilets on recreational boats simply can’t handle as much as a toilet in a home, so periodic maintenance, such as the prevention of calcium buildup, pumping out marine life and using biodegradable detergents are just a few things to do to prevent clogs. It seems some people in these states could use some advice about preventing a clog from happening. There is actually a way to test whether or not something is flushable. Toilet paper disintegrates in water, so if you take an item you’re not sure is flushable, swish it around in a bowl of water and let it sit there for an hour, you’ll discover if it’s flushable by whether or not it disintegrates. Items that remain intact will certainly clog your toilet and create a lot of hassle for you. It might also be prudent to tell your kids that their dolls and action figures would really prefer to swim somewhere else. Beyond that, there is actually an app that will test the flushability of something for you. Plunging is also not as simple as it may seem. Firstly, you have to buy the correct kind, rather than whatever is the cheapest. It’s recommended you get one with a flange, or smaller piece of rubber in the center, so the most suction possible is created. For nasty clogs, you’ll want to shut off the water flow to your toilet, which can be done by turning the metal knob at the bottom. You can also fill a bucket with warm water and a few drops of dishwashing soap, and pour it into your toilet. Every once in a while you’ll get lucky and this alone will break up the clog. If not, seal the hole with the plunger, and push down quickly four or five times, then lift up quickly. This suction creates pressure that will hopefully dislodge the clog. Happy plunging!